We uncovered the remains of part of the Roman circus: these were what we expected to uncover and where we expected them, but what we didn’t know was the condition of the remains. 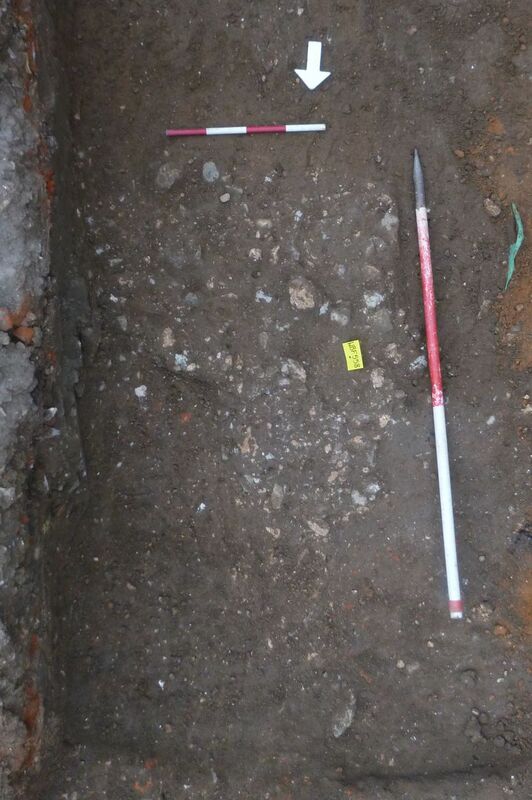 We exposed a part of the Roman circus which includes the foundation of the inner wall and the foundation of the outer wall of the northern seating-stand, and part of the surface of the arena itself. The remains here are relatively well preserved. The foundation of the inner wall was quite shallow – only about 20 cm deep – but it would only have supported the comparatively low wall between the seating-stand and the arena. The foundation of the outer wall was more substantial, and we didn’t excavate down to its base. The outer wall would have supported the high external wall of the seating-stand as well as the earthen mound and wooden tiered seating of the seating-stand between the two walls. However, it was the arena surface which produced the most information about the Roman circus this time. Trust director Philip says that our exposure of the remains of the Roman circus this time was ‘unusually informative’. We don’t get to investigate the arena surface very often. It was a dirt surface and it was covered with a spread of debris from the demolition of the Roman circus in, we think, the late 3rd century. The Roman circus was demolished so that its materials could be removed for re-use in other buildings, but loose chippings were left behind. We have excavated demolition debris from other areas, so it must have been left lying all over the arena when the Roman circus was demolished. This gives us a vivid image of the Roman circus near the end of its story. Most importantly, we have also now been able to establish the Roman ground-level because of the surface of the arena here. The whole site of the Roman circus is a Scheduled Ancient Monument. We have now covered the remains here with a protective membrane and backfilled them. 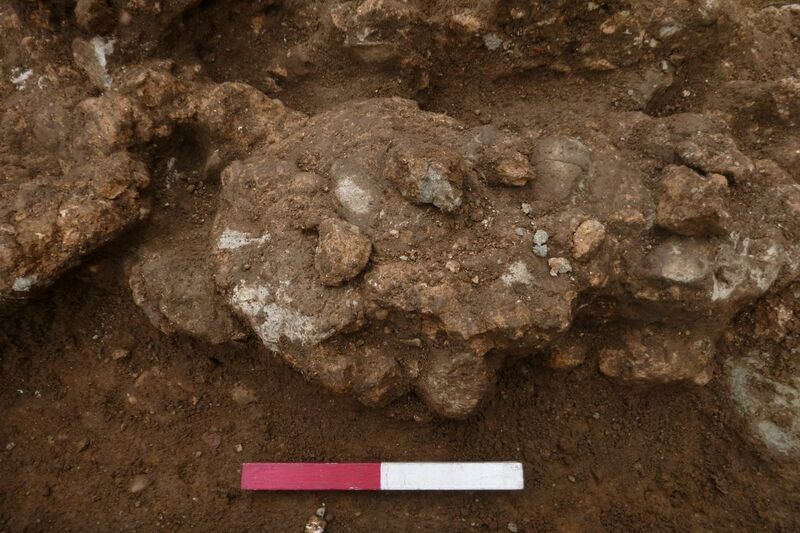 Our exposure of the remains of this part of the Roman circus has led to the re-siting of a new pipeline on the site to preserve the remains here, which is a good result of our investigation. 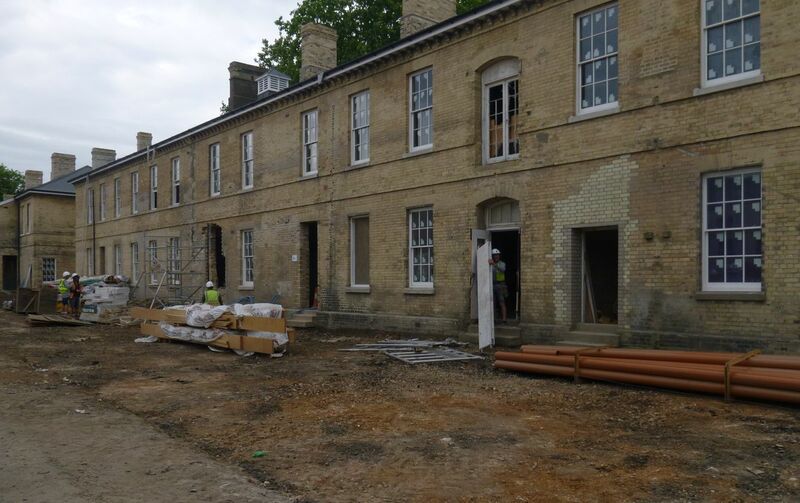 The watching brief is being funded by Taylor Wimpey. Trust archaeologist Mark Baister is supervising the site, assisted by Trust excavators. You can visit the site of the Colchester Roman circus and our Roman circus visitor centre: information on this web-site at www.thecolchesterarchaeologist.co.uk/?p=36229 . 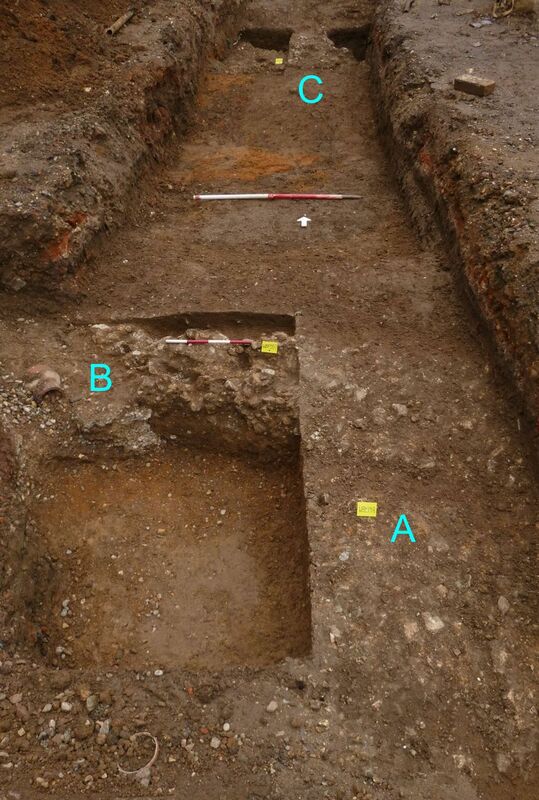 The images show the site and a block of 19th-century former military buildings at the Flagstaff House complex (above); and, below, the remains of part of the Roman circus on the site (ie looking north from the arena – A marks the exposed arena surface, showing fragments of demolition debris; B marks the inner wall foundation; and C marks the outer wall foundation); part of the foundation of the inner wall in close-up; and the arena surface.